During the AALS annual meeting, I was fortunate to be panelist on the program organized by the Committee for Research, entitled " Everything We Wish We Knew About The World of Legal Education: An Agenda for Research." 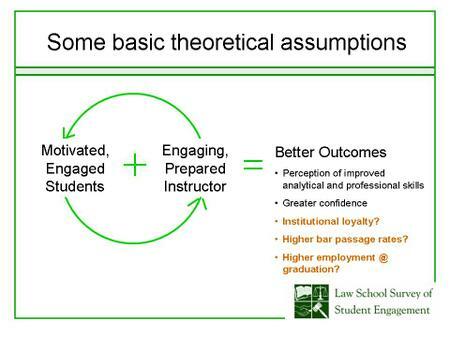 One of the items discussed by the panel was the research value of data from the Law School Survey of Student Engagement (LSSSE). 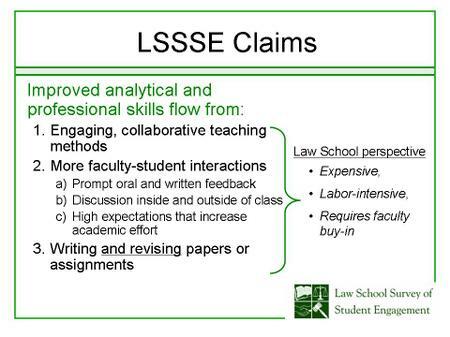 LSSSE is the law school version of the National Survey of Student Engagement (NSSE), which is utilized by over 50 percent of all undergraduate institutions. In short, LSSSE and NSSE are rapidly becoming the leading method quality control within a competitive educational marketplace. 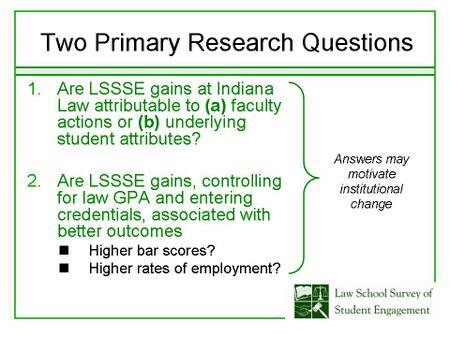 For the past five years, LSSSE has surveyed law students at 110+ ABA-approved law schools on a wide variety of topics, including student-faculty relations, type and volume of feedback from professors, time devoted to studying, student evaluations of learning gains, allocation of time between school, work, family, and co-curricular activities, etc. The 2006 LSSSE survey instrument can be found online here (note: each question equals one or more variable in the dataset). Fortunately, here at Indiana Law, we have participated in LSSSE for five consecutive years and hence have a terrific longitudinal dataset. Ken Dau-Schmidt, Jeff Stake, and I recently drafted a research design for LSSSE data, which I presented at a separate AALS panel ("Learning, Educating and the Law School Years"). Below the fold are three slides that (a) identify LSSSE claims, (b) summarize our basic theoretical assumptions, and (c) state our two primary research questions. Our full PowerPoint presentation can be accessed here.